The Russian game-making master Alexey Pajitnov is at it again. The creator of the now-legendary Tetris and its standout follow-up Welltris has written another one—Faces & ... Tris III. Having exhausted, in his two earlier games, the dimensions in which to manipulate falling blocks, Pajitnov brings forth a new concept. In Faces, blocks still fall against a graphic mural background. The difference is that each block contains one of five pieces of a face. Your job is to pile up a chin, lips, a nose, eyes, and a top of the head in the right order. You get more points if they happen to be from the same person, but mixed faces are OK, too. A face constructed out of order turns into a marble block, which obstructs further progress. See how your skills stack up in Faces. It sounds simple—and it is. Simplicity and elegance are Pajitnov's trademarks. But whereas his two earlier hits resembled interactive creative puzzles, Faces too often resembles an animated jigsaw puzzle without the interactive variety of Tetris or Welltris. The 60 faces themselves are a delightful mix of historical figures (Napoleon), whimsical monsters, holiday faces (Santa Claus, Uncle Sam), and a variety of cultural images (Mona Lisa, Shakespeare). Only 16 of the faces are identified in the manual as part of the documentation-based copy protection. Watch for some amusing touches in the faces. Gorbachev's eyes shift back and forth as they fall down the screen, for example, and there are other small, unexpected bits of animation in the faces. 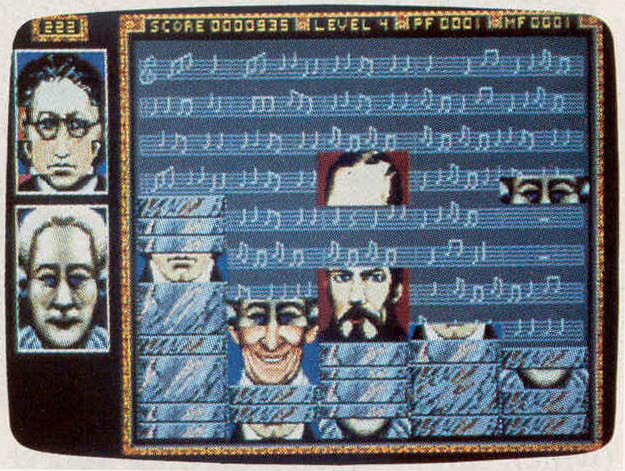 The graphic mural backdrops are intricate gray-scaled American scenes and patterns matching the set of faces used in each of the ten levels. The vanity board and several sign-on screens use the full VGA color palette, as do the faces themselves. Faces is a good game with excellent and entertaining graphics and enough challenge to make it worth playing. It faces an uphill battle, however, in its unenviable position as the third in the Tetris series. What may be more compelling than the game itself is anticipating what Pajitnov will accomplish the next time around—especially if he abandons falling blocks.